Aircraft energy system components, including sources, loads and distribution, have multiple commitments and responsibilities. Often much of the system is comprised of power electronic converters for sources, loads, and energy storage (chemical, mechanical and thermal). For example, a point of load power converter has the commitment to serve the energy needs of the end load. However, if the power system collapses, the needs of the load cannot be met. Therefore, it is also in the interest of the conve1ter to contribute to the global stability of the power system by reducing nonlinear dynamics and incremental negative impedance. One method to mitigate the destabilizing effects of constant power loads is the power buffer concept. A power buffer is a device that mitigates a destabilizing event by presenting controlled impedance to the supply during the transient while local energy is used to maintain constant power to the load until the system can recover. A power buffer may include additional hardware, or may merely be a modification of the controls of an existing active front end power converter. However to date the use of a load as an energy asset in a power buffer has been limited to traditional chemical (capacitor and battery) storage devices in the electrical network. Next generation aircraft may have a broad range of potential assets in the form of loads, including inertial spinning devices and thermal systems, which could be utilized in the overall energy strategy. •	Develop and document a mathematical model of the aircraft energy systems including thermal and inertial loads. •	Formulate a decentralized power buffer control including inertial and thermal loads as energy storage assets. •	Modelica. The models will include aircraft system and controls. •	Validate theoretic results through simulation under stressing scenarios. 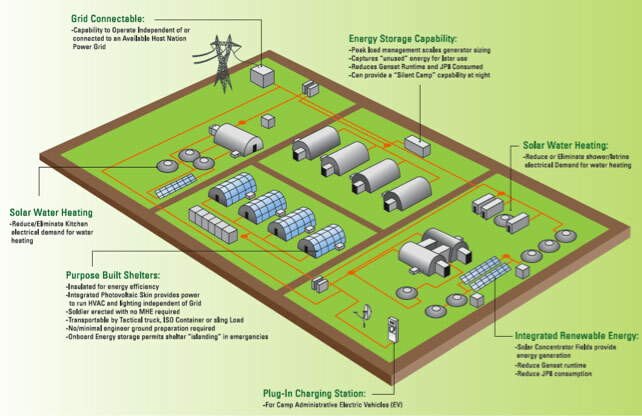 A remote microgrid is a class of stand-alone power grids that services diverse loads, employs distributed generation with renewable resources, and requires on-line control and optimization to maintain stability and power flow. The grid control system is both agile and autonomous, accommodating rapid changes in generation and load resources with minimal training or intervention on the part of human operators. Control based on a hybrid approach that marries novel model-predictive control strategies with multi-agent systems. Utilizes artificial intelligence and machine learning techniques. By imbuing software agents with component models and knowledge about grid operations the collective can cooperatively plan and execute coordinated operations that essentially re-organize grid structure in real-time while maintaining uninterrupted service.